Hopefully this works to cover up some of those pesky freckles! 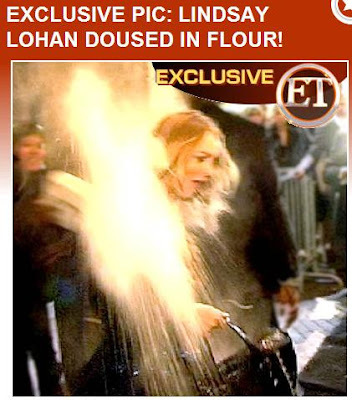 Lindsay No Pants and Samantha Rotten were in Paris over the weekend and heading into a club when some PETA freaks tossed a bag of flour on Linds because she was wearing a fur stole. Lindsay must have thought it was raining coke! A total dream come true. Lindsay was, of course, pissed and the club owner had to help dust off Lindsay once she entered. Stars, they’re just like us! I love those PETA freaks. They’ve inspired me. On my way to work tomorrow I’m going to throw a gallon of acid on someone holding an umbrella and yell “Don’t Support Acid Rain!” I think it’s good I have a new cause to believe in. So I Guess Mrs. Knowles is Making Clothes for Solange Too?